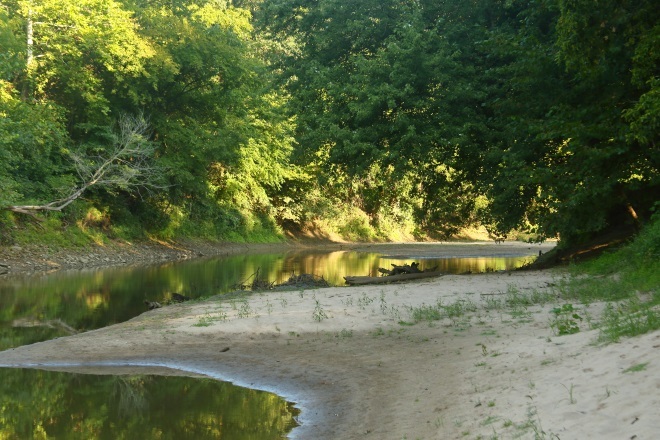 It's not easy to hide 1,000 acres of wooded ravines and bottomland. And to be sure, the area is on maps, so the existence of these acres is not exactly a secret. 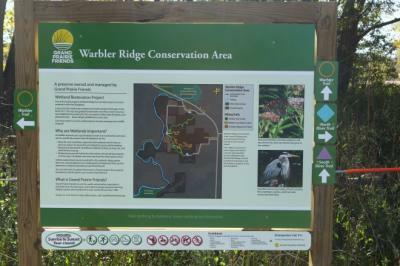 Yet the 1,000 acres that comprise the Warbler Ridge Conservation Area are unknown to just about everyone outside Coles County where they are located. Purchased over a period of six years by the Champaign County-based conservation organization Grand Prairie Friends, the parcels of land that make up Warbler Ridge represent a unique Illinois natural area. Situated between the city of Charleston and Fox Ridge State Park, the area owes its unusual topography to the glaciers that covered the land tens of thousands of years ago, and the river that drained the water from the melting glaciers. During the last ice age, the Wisconsin glacier extended south as far as the middle of Coles County. There it stopped, leaving a massive ribbon of glacial debris known as the Shelbyville Moraine. Some of the water from the melting glacier drained south via the Embarras River, which cut through the moraine. Water running into the Embarras eroded the land, forming the deep ravines of Warbler Ridge and the surrounding region. "That's all very interesting," you may be thinking. "But aside from the geology lesson, what does that have to do with me as a Master Naturalist?" I'm glad you asked! Warbler Ridge may be unknown to all but a few, but Grand Prairie Friends doesn't want it to stay that way. So let me tell you a bit about what you might see if you visit. 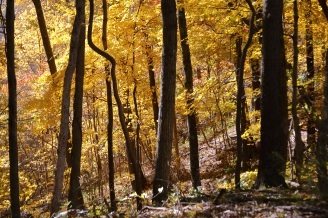 First, there are the wooded ridges and ravines. Even if there were nothing else, these alone would be worth a trip. 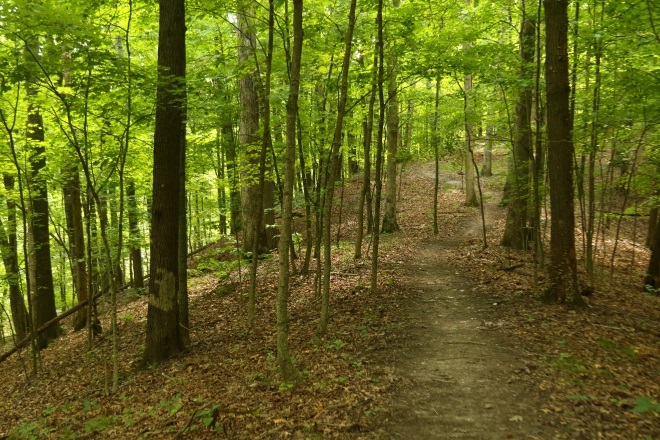 It's hard to beat the feeling of peace and relaxation that comes from a hike through the woods in summer. But then, as if to show you that the woods are not one-dimensional, summer turns to fall and the forest puts on a spectacular show of fall colors. Winter can be a bit dreary, but once April rolls around the woods provide a whole new array of attractions. 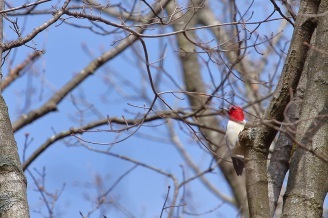 Early spring is actually a wonderful time to look for birds. The leaves are not yet out on the trees, giving hikers an unobstructed view of birds, a view that would not be possible later in the year. Hikers who look down as well as up are in for many more treats. Spring is the time for ephemeral wildflowers to make their appearance. The Warbler Ridge Conservation Area has been surveyed to assess its floral diversity. 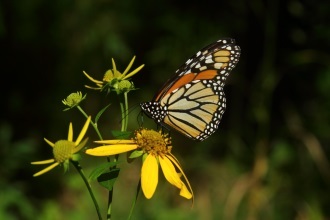 Over 100 species of plants were identified in the original 144 acres of woodlands purchased by Grand Prairie Friends. With the addition of bottomland and more forested areas to the site the total now is considerably higher. Looking down has rewards at other times of year as well. 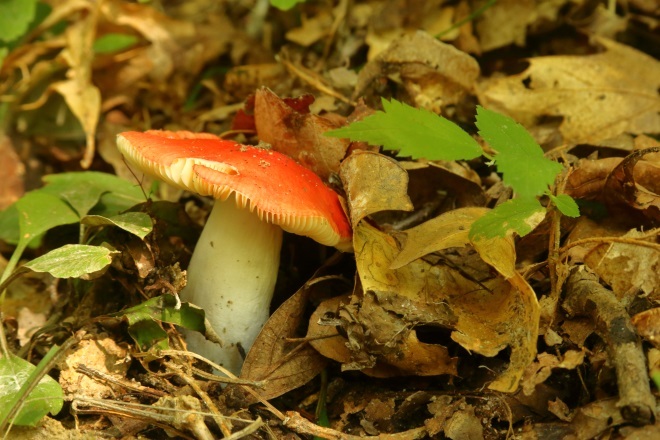 Many colorful mushrooms and other fungi are abundant on the forest floor and on fallen tree branches. Although some are easy to see, most are small and not immediately obvious. 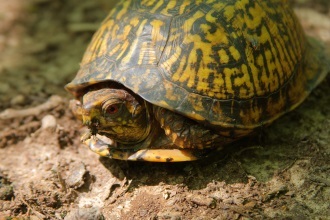 Animals such as Eastern box turtles are also abundant, though not so commonly seen. But suppose that, although you love nature, you don't love the thought of hiking up and down to climb into or out of ravines. Warbler Ridge has something for you, too. The Embarras River was not only responsible, albeit indirectly, for the striking ravines eroded out of the surrounding land, it also carved out a wide floodplain of its own, land that floods just about every spring when the river swells with snowmelt from winter. The plant and animal life on this bottomland is, as you might expect, completely different than that found in the forested areas. Plants that grow there must be able to withstand annual inundation. And the animals must be able to thrive in open areas with few trees and a different collection of plants than are found in the adjacent forests. Life is certainly versatile, though, so if you hike along the river, there will be plenty to see. The Embarras River itself is worth a glance. Except for the spring when it floods, the river is a placid, slowly moving stream that exudes a sense of tranquility. The unimproved trails along the river afford many beautiful views. If you like flowers, hiking along the river may be just the ticket for summer or fall hikes. 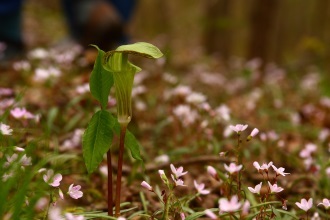 Woodland flowers are at their peak beauty in the spring. They leaf out and flower to take advantage of the sunshine that reaches the forest floor before the leaves appear on the trees. By early summer, they are mostly gone. The bottomlands along the river, on the other hand, have a different flora, and many of the flowers there bloom well into the summer and early fall. For an attentive Master Naturalist, this pattern of flowering can be instructive. Flowers bring insects. Hence, not only will you see a different collection of flowers in the bottomland than in the forest that cloaks the ridges and ravines, you will likely also see many more insects, and different ones than tend to inhabit the woods. But that's not all. Where there are insects flying around there are predators that would like to make lunch or dinner of them. That means spiders and their webs. If you hike there in the fall you are likely to encounter many webs. Orb-weaving spiders, though many are only an inch or less, legs included, often spin large webs, several feet in diameter. These webs can be quite beautiful, especially when backlit by the morning sun. 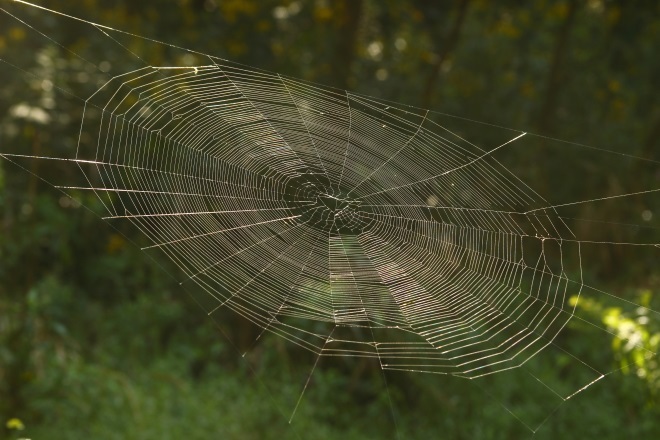 Unfortunately for hikers, the webs are usually positioned across open areas –such as hiking paths. If you're not careful, you may walk right into one. The spider is unlikely to get on you because something as large as a person in a web will simply cause the spider to run off to the edge. Most people just don't like to deal with strands of a spider's web on their faces or in their hair. Of course, as a Master Naturalist your reaction to a spider's web may be to whip out your notebook and camera rather than saying "ugh!" If we learned nothing else from our Master Naturalist training it is that there's always something new to learn about in nature. Even if it's in the form of a yucky spider web. So there you have it, 1,000 acres of Warbler Ridge Conservation Area in a nutshell. Just kidding, of course. Even a much longer article would only begin to scratch the surface in describing the natural wonders to be found in this amazing site. Take a look at the map here and go for a visit. When you do so, bring a friend or five. If you love being out in nature, you won't be disappointed. You can get more information from the Grand Prairie Friends website. Check it out. This blog was written by East Central Illinois Master Naturalist Fred Delcomyn (2017). It can also be found in our volunteer driven newsletter Field Notes. Find more from Field Notes here!